A key aspect of Trumps administration is uncertainty. He hires and fires ‘supporters’ at will. He changes his mind on an hourly basis and risks political ties. He uses his new found power for personal gain and to increase the wealth of the 1%. As The New Yorker points out: “Donald Trump will go down in history as the troll-in-chief” (Cassidy, 2017). And you never know what to expect from a troll. This all leads to a steep decline in trust – in the administration, in politics, in the economy and in people and institutions across the country. And trust, or a change in trust, has impact on how people interact with each other. How business is done. If everybody is under investigation and nothing is certain, people will most likely hold back (crucial) information. This decreases transparency and hinders people from making certain choices. People want some sort of security – in personal life as in business. Hence, unsurprisingly, this fall in trust stemming from Trump’s administration can already be felt, drastically. Since the Trump took office, daily average flight searches to the US declined drastically (cf. 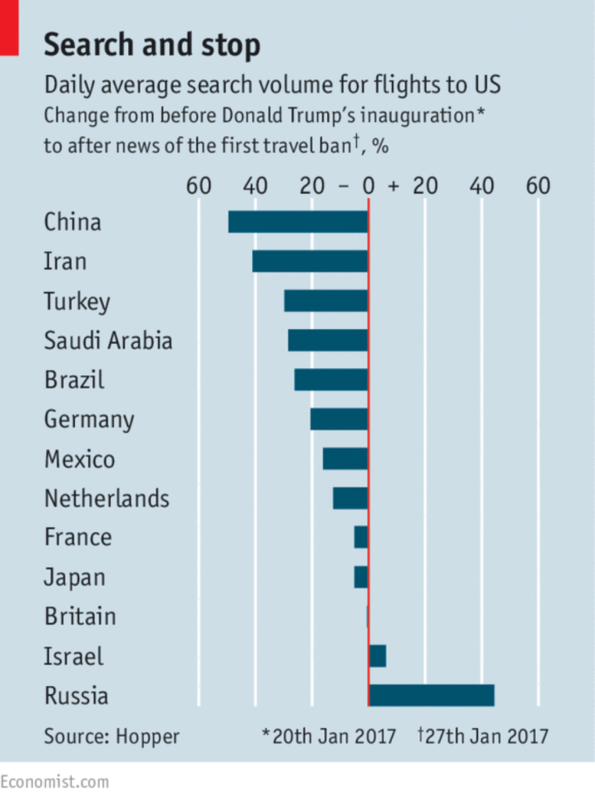 The Economist, 2017 Apr 22) – except for Israel and Russia – and international visitors are down by 10% in the first quarter of 2017 compared to the previous year (cf. Glusac, 2017; Tuttle, 2017). Hence, Trump’s anti-immigrant agenda – from Muslim bans to increased border controls – takes its toll on the US. With tourism down, the industry will suffer as international visitors bring a few billion dollars to the US. But it’s not just tourism. Reforms to H-1B Visa, which allows to (temporarily) hire foreigners for specialist roles, play their part as well (cf. Brustein, 2017). This means, highly skilled people are being kept out and international and innovative companies, not just in Silicon Valley (California still has a say), are being left out. In a globalized world, the US is becoming less attractive and competitive. Sad. As ProPublica points out, immigration is a tremendous opportunity to strengthen and increase economic growth (cf. Groeger, 2017). The current US president is aiming at the exact opposite. Economic slow-down, at least for most of the economy. The rich will obviously get richer. 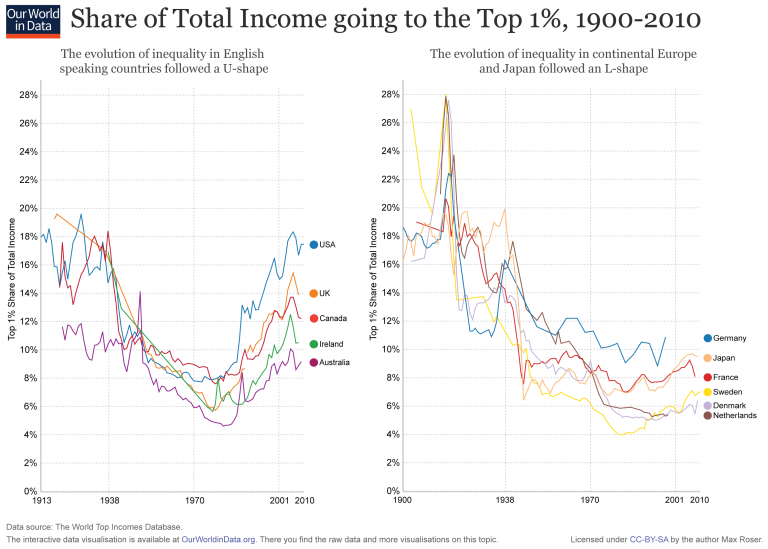 Though, to be fair, the income inequality in the US, respectively the total income going to the top 1%, has been increasing since the 1970s (cf. Roser & Ortiz-Ospina, 2017). With the current uncertainty, a lot of international firms put their plans to move to or expand in the US on hold. At the North American site selection and market entry consultancy Blair & Partner / Navigator Consulting, where I am a partner, we noticed this throughout all our projects. Management is unlikely to invest in a country where everything is uncertain and increasingly unstable. According to the German business magazine Wirtschaftswoche, foreign direct investment (FDI) into the US has decreased by 40% in Q1 2017 compared to Q1 2016 (cf. Rahmann, 2017). This means fewer companies choose to invest and settle in the US. Obviously, not all investment always leads to more economic growth, jobs, and innovation. But overall this is certainly true. Hence, a 40% drop will be felt – one way or the other. Consequently, we also see an increase in demand from economic development agencies in the US at Navigator Consulting. States and communities in the US are worried. Additionally, some states in the US, like California as the obvious example, do not necessarily follow the same course. Which is to some extend good, but it also leads to more confusion and uncertainty. A union without (some) states is not necessarily a union. Hence, the states in the US seem to drift even further apart, which will split the country, hinder business and decrease trust. Furthermore, universities across the US are experiencing a drop in international students (cf. Saul, 2017; Anderson, 2017), which is attributed to Trump. Fears of Muslim bans, uncertainty in regards to health insurance and visa requirements as well as border controls are not very attracting for international students. Who can blame them? This drop of motivated and skilled people will further stifle the economy and innovation in the long run. Trust is central to an economy, after all it is it’s backbone. Without trust, contracts – social or corporate – would be hard to achieve. How can you trust the value of your money? How can you trade with your neighbour, if you do not trust him? 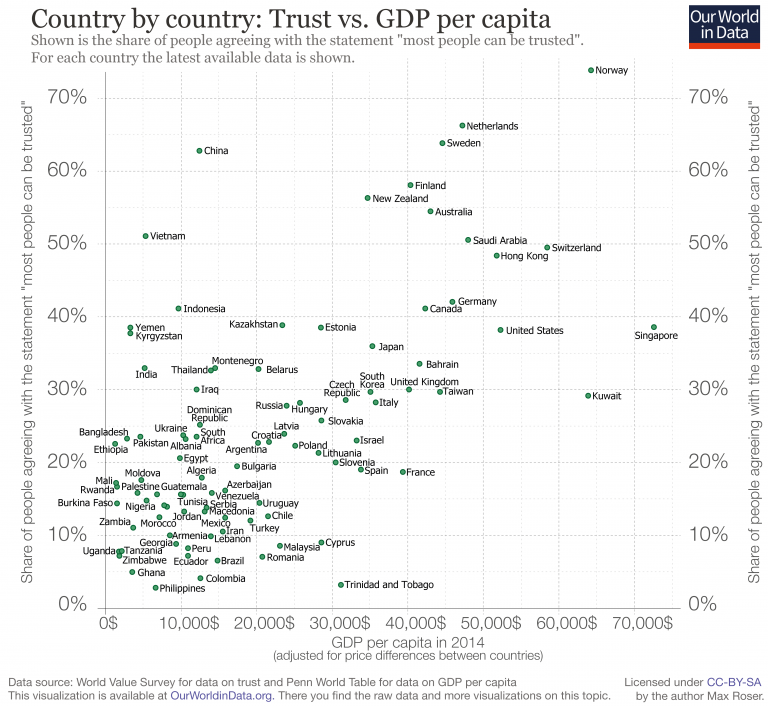 Unsurprisingly, Ortiz-Ospina and Roser (2017) see a strong positive relationship between trust and GDP per capita. The more people trust each other, the likelier it is that the economy will benefit. Consequently, economic equality is negatively impacted by trust (cf. Ortiz-Ospina & Roser, 2017). This means lower trust leads to higher inequality (Gini index). People are simply worried about what to expect, which can be felt when you actually visit the US, but also – for instance – in increasing interest in encryption services (e.g. Martin, 2016). A lot is uncertain and people want to protect themselves, which is not good for overall trust. And a lack in trust will ultimately worsen the economy, as above numbers and examples tell. Trust is trump, but Trump does not provide for trust. Where this will lead, I don’t quite know, but the signs are not overly positive. The Economist (2017, January 21). Embolded stats: California steaming. The Economist, p. 31.